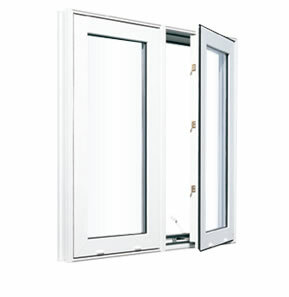 The benefits of choosing a casement window opening design are many. The principle benefits come from their innovative sash design which puts pressure on the frame creating a strong airtight seal. Our casement windows feature slim proportions and large glass area that deliver an attractive, yet, energy efficient window choice. Various options allow you to adapt the style of these windows to your home, including a stylized exterior sash, authentic interior wood molding, and a bevel sash. This design choice allows you to catch natural breezes and a direct fresh air flow into any room in your home where you have them installed. They work especially well in access areas that are difficult to reach such as over the kitchen sink or behind hard to move furniture. We are especially proud of the crank design and mechanical efficiency of the hardware featured in our our casement windows. We enjoy watching customers experience our window hardware because it works so well and easily. We believe in using superior hardware because when we build them into our window, you get a lot more satisfaction and peace of mind every time you open or close your new window. Your Window’s Energy Efficiency & Performance Starts Here. Please view our cut away design of Maritime Door & Window’s technical assembly and build quality. These technical features highlighted here are the performance qualities that contribute the most long term value inside and outside the structural frame of your window. This efficiency performance and build strength is added your home or commercial building when you chose Maritime Door & Window as your supplier. Two frame depths are available (3¼" and 4 9/16") to accommodate all construction needs. The deeper that windows are set into the walls of a home, the more protected they are from bad weather, maximizing energy efficiency. These windows have triple weatherstripping for maximum airtightness. Various types of glass (simple, double, or triple) and glass thickness (⅜" to 1⅜") can be used, depending on your budget and specific energy efficiency needs. Frames may include grooves into which various accessories can be inserted, such as exterior brickmolds and interior jamb extensions, trim, and rosettes. Frames with integrated brickmolds are also available. They not only maximize the look of windows at the front of your home, they also ensure better water resistance and help reduce installation time. If no accessories are desired, a solid frame finish is also available. Hover or click on the red dots to view the explanation of our features and quality that goes into the technical performance and physical longevity that goes into every window we make. Please consider visiting our ideas Showroom to view an actual cut-away model of our window engineering. * These colours are a representation. Factory Stainable Wood-Finsh Window Products – Looks like wood, inside and out! Durable PVC windows with a stained finish that can be applied inside as well as outside, DOUBLENATURE™ products provide the most realistic wood finish for your windows. Can be stained in your choice of golden pecan, oak, mahogany, or walnut finishes. Similar to casement windows, but wider than they are tall. Awning windows open outward from the bottom and are commonly used for ventilation above a door or positioned in a row or against other windows. A true classic, single-hung windows offer charm and versatility. These windows slide open vertically and stay in place. This space saving design means you can open them without consuming exterior space. Smooth and functional, single-sliding windows provide one horizontally sliding sash and one fixed sash for a tough barrier between your home and the weather. Add character and distinction to your home with custom-designed decorative windows from MD&W. Available in virtually any shape, these windows are a wonderful way to make your home unique.